This edition of the Kempens Informatieblad comes as a late addition to the newspaper’s run under the editorial stewardship of Jef Geys, from the late 1960s to 2018. Under Geys’ editorship, the Kempens Informatieblad was an organ that gathered and distributed matter surrounding his activity as an artist. At the end of the 1960s, when Jef Geys adapted the masthead of this local newspaper to his own aims, the evening editions of daily papers had already faded as a commonplace. Evening editions once served to update their readerships on the fact that the news had changed since it was recorded that morning. This present edition of the Kempens Informatieblad is not an updated edition, since an original was never published. What it does contain, akin to an evening paper, is the editor’s earlier decisions with an update to the news. Since this edition was conceived, its master, subject, and editorial custodian Jef Geys passed away. The completion of this issue marks the reiteration of As Sombras de Lisboa into seven paravents, exhibited at Yale Union in the spring of 2018. 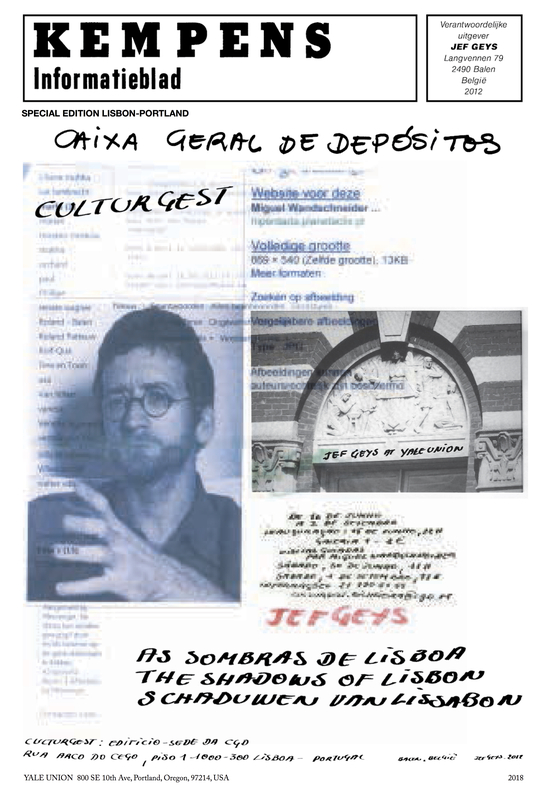 Published on the occasion of the exhibition JEF GEYS, curated by Nicholas Tammens.